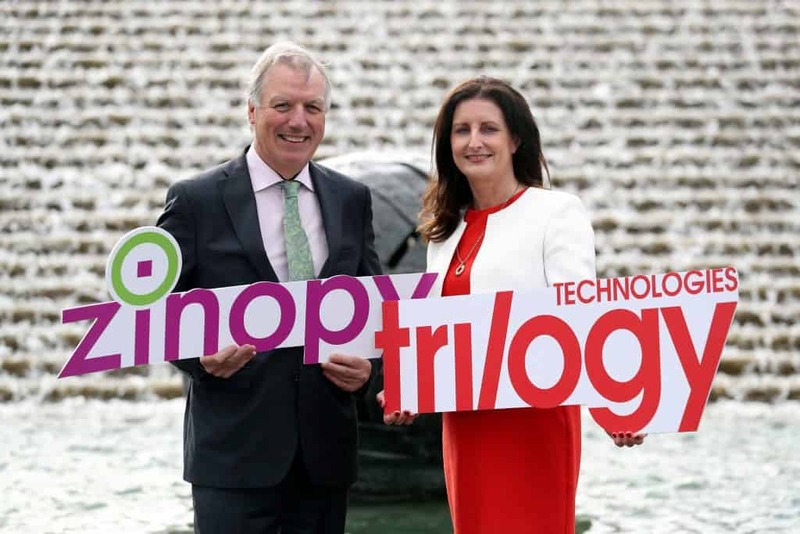 Dublin, 17 September 2018 – Trilogy Technologies Group, one of Ireland’s leading independent ICT Managed Services providers, today announced the acquisition of Zinopy Security, a specialist provider of IT cybersecurity and workspace virtualisation solutions, in a deal that will create a new group with annual revenues in excess of €20 million. Post the acquisition, Trilogy will employ approximately 100 people and will relocate to a new purpose designed office accommodation (8,500 sq ft) in Park West Dublin to facilitate the expanding business. Trilogy Technologies, a leading provider of managed IT services based in Dublin and London, will deepen its services offerings in the area of Managed Security with the addition of Zinopy Security, providing a range of IT and cyber security solutions including virtualisation and cloud computing; IT security and risk management; mobility; and professional, managed and consulting services. “The acquisition of Zinopy is a transformational deal for Trilogy, positioning us as a fast growing group at the forefront of managed IT and security services in Ireland. We are delighted to join forces with Zinopy, which is one of the most highly regarded specialist IT security brands in the country. “Trilogy is already Ireland’s leading provider of remote IT managed services and together the group is well placed to take advantage of the significant growth opportunities in managed IT services domestically and in the much larger UK market, where we now have new opportunities to build on our existing footprint. “Over recent years, Zinopy has established itself as one of Ireland’s leading IT specialist and cyber security providers experiencing strong growth as the market recognises the need for secure IT solutions in an ever more complex world. Zinopy was founded in 2010 by John Ryan and Ger Coakley, following a management buyout of Entropy Ltd. In 2012, Zinopy acquired Maxima Ltd. The company employs 40 people. The acquisition of Zinopy follows the 2014 acquisition by, Trilogy of B2Lateral in central London, which gave the company a presence in the UK market for the first time. Trilogy was supported on the Zinopy deal by Mazar’s Corporate Finance, which provided advice and management of the process. Edel Creely, Group Managing Director of Trilogy Technologies, and John Ryan, CEO of Zinopy, at Park West in Dublin announcing Trilogy’s acquisition of IT cybersecurity specialist Zinopy to create a new force in the Irish ICT market. Trilogy Technologies Group is one of Ireland’s leading independent IT managed services providers to companies that depend upon secure, reliable and compliant IT infrastructure to underpin the success of their business. It partners with key leaders in industry to provide technology infrastructure and cloud services, managed services and support to satisfy domestic and international requirements.